The figure of German judge and prosecutor Fritz Bauer had a symbolic significance to his contemporary Germany, that of the 1950s. The country, then still coming to understand the impact and legacy of the Nazi regime, needed people like Bauer, a man of clear values willing to do whatever it takes for justice, and unwilling to ignore the country's recent past. Again and again in The People Vs. Fritz Bauer, Bauer is the sticky wicket, obstructing people's rosy notions of their new Germany, making him easy to root for even if he doesn't provide the most dynamic or compelling hero. 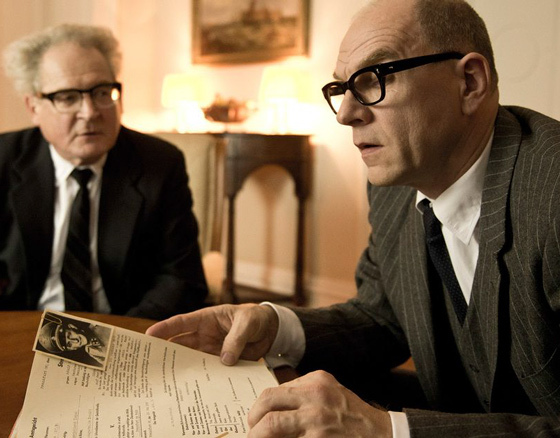 In this based-on-a-true-story film, Bauer (Burghart Klaussner) is a German attorney general who, in part, is tasked with bringing Nazi war criminals to account. As a Jewish man himself, he runs up against a system where bureaucrats are in place that were part of the Third Reich government. When he receives information that the notorious Adolf Eichmann is living in Argentina, he starts trying to bring him to justice, enlisting state attorney Karl Angermann (Ronald Zehrfeld) to help. Angermann's a bit of a red herring, though. Where Zehrfeld was an asset to Phoenix, arguably the best received German film of the past few years, here he plays another man with a weakness for the nightlife, and frankly, he's something of a distraction. He moves Bauer's goals along slightly, serves as witness and then mostly fluffs the runtime. There isn't a ton to witness, either. Wheels turn as Bauer and those he appeals to try to confirm the identity of this man living in Argentina, but with little drama, urgency or dynamism. The old and sickly Bauer can't be expected to go and knock down Eichmann's door himself, and the obstacles he does face, from the obstructionism and complacency of the functionaries around him, don't thrill and really do little more than draw the film out. At least Bauer has a point of view in the film, one that still speaks to our present condition. He takes whatever opportunity he can throughout the film to rail against individualistic values of his time, against Germans who would rather have a new kitchen than see their country atone for its sins. If the film could live up to its sweeping title a little better, we could understand the ending as a true victory. The People Vs. Fritz Bauer is too concerned with the nitty-gritty details of tracking down a Nazi war criminal when its heart should really be in confronting a country's own idea of itself.